Emotion regulation strategies have been linked to the development of mental disorders. In this experiment, we investigated if imitation is an effective way of learning to increase the usage of the emotion regulation strategy ‘distraction’ for 22-month-old toddlers. Toddlers in two experimental conditions participated in two waiting situations intended to elicit frustration, with a modeling situation between the first and the second waiting situation. In the modeling situation, toddlers observed how either a familiar model (parent) or an unfamiliar model (experimenter) demonstrated the use of distraction as a strategy to cope with a frustrating situation. Toddlers in an additional age-matched control condition did not witness any modeling between the two waiting situations. Analyses revealed that toddlers in both experimental conditions combined distracted themselves more in the second waiting situation than did toddlers in the control condition. There were no differences with regard to the familiarity of the model. These results suggest that providing structured observational learning situations may be a useful way to teach toddlers about the use of specific emotion regulation strategies. The authors would like to thank all families who participated in this study. Thank you to Cordula Eichfeld, Mareike Groene, Laura Drietelaar, Gina Hassel, and Lena Liedmann for help with data collection and coding. The present study was supported by a grant from the German Research Foundation (Deutsche Forschungsgemeinschaft; SCHN 415/8-1;AOBJ:632124). All parents provided written informed consent prior to participating in the present study. McLaughlin, K. A., Hatzenbuehler, M. L., Mennin, D. S., & Nolen-Hoeksema, S. (2011). 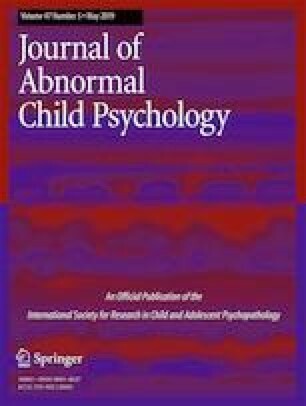 Emotion dysregulation and adolescent psychopathology: A prospective study. Behaviour Research and Therapy, 49(9), 544–554. https://doi.org/10.1016/j.brat.2011.06.003.